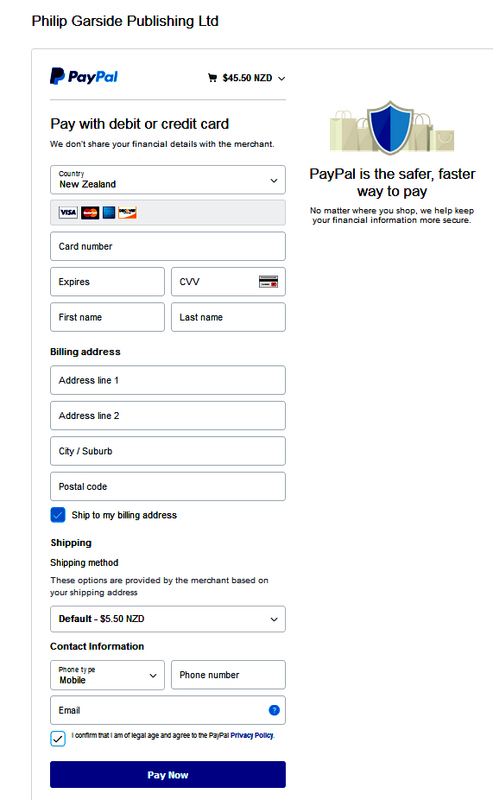 Ordering via the PayPal Add to Cart buttons gives you a secure way to order and pay online using your credit card. You do not need to have a PayPal account to make a payment. You can enter your credit card, address and other details when you make a purchase. These instructions are for customers in New Zealand. This screen shows the titles you have added to the cart, the postage (shipping cost) and the total cost. To pay using your existing PayPal account (option 4 above), enter your email address and password and click the darker blue Log In button. You then complete the payment using the credit card you have already told PayPal about when your set up your PayPal account. 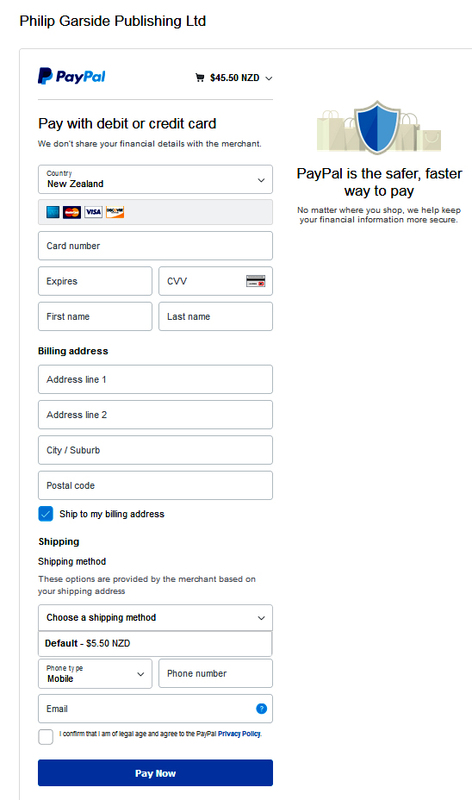 First change the country setting at the top from United States to New Zealand by clicking the down arrow and choosing New Zealand. Then enter your credit card, name and address details. You also need to choose a shipping method by clicking the down arrow next to the words Choose a shipping method. 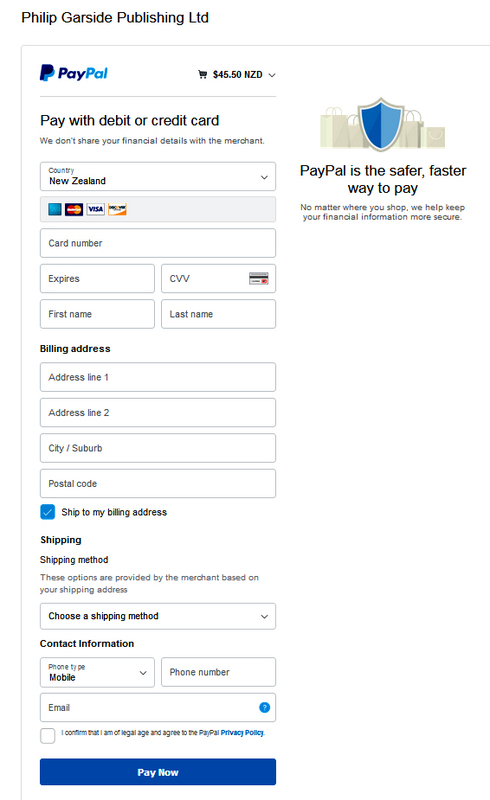 Depending on the total value of your order your order this will show as Default $5.50 NZD, Default $7.00 NZD or Default $0.00 NZD. Click once on the amount that appears. Then click the blue Pay Now button and your payment will be processed. You will receive a confirmation of your purchase on screen and by email. We also get an email from PayPal showing the details of your order, name, address and payment. If you have missed entering any details on the last screen, PayPal will highlight these in red. Please enter the missing details and click the blue Pay Now button again. 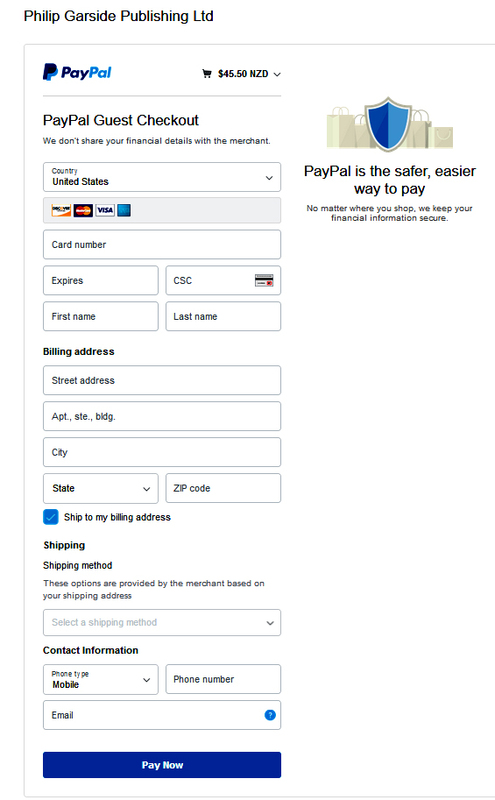 As you can see there are several steps involved in ordering using the PayPal shopping cart. 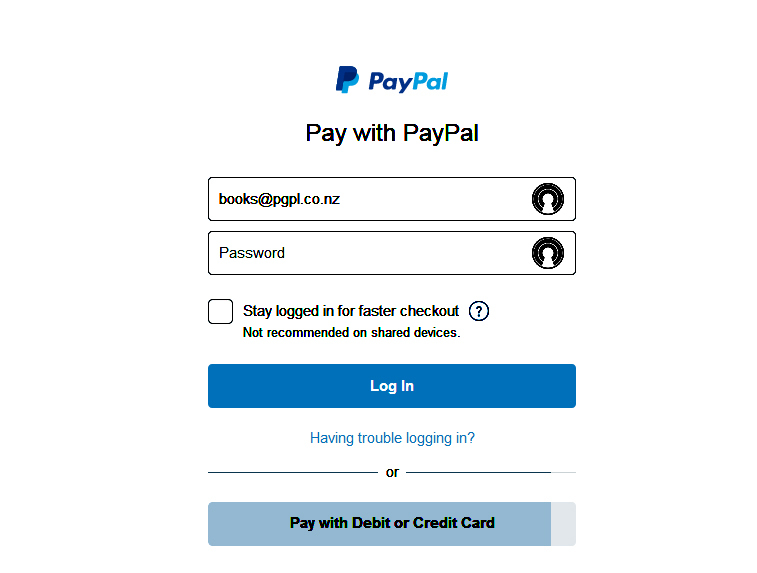 If you have any problems using PayPal, please tell us by emailing books@pgpl.co.nz or phoning 04 475 8855. Remember that we do not require you to use PayPal to order from us. We are just as happy to invoice you so that you can pay us by online banking, phoning us your Visa or Mastercard details or posting a cheque.